Team sizes: 4 vs 4. Objective: catch and score the most resources. Time out: once the 5 minutes timer runs out, the team with the highest score wins. Bots respawn: 10 seconds delay. Special entities: no special entities in this mode. Team sizes: 6 vs 6. Objective: capture and hold bases to score the most points. Once a bot enters in close range of a neutral (white) or enemy (red) base, it starts capturing it. Capturing a base takes 10 seconds by default. Each new bot helping base capture adds a 20% capturing speed bonus. Example: it will take 7.14 seconds (10/(1 + 0.2 + 0.2)) 3 bots are capturing a base. Once a base has been captured, it scores 1 point every 10 seconds by default. 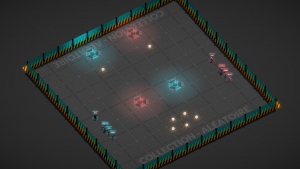 Each bot present on a captured base (at short range) adds a 10% scoring speed bonus. 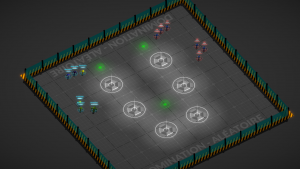 Example: if there's 5 bots on a captured base, it will score 1 point every 6.67 seconds (10 / (1 + 0.1 + 0.1 + 0.1 + 0.1 + 0.1)). Bots respawn: 7.5 seconds delay. Team sizes: 8 vs 8. 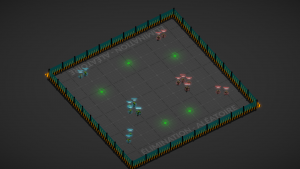 Objective: destroy the most of your opponent's bots. Each kill gives 1 point to the shooter's team. Bots respawn: no respawn in this mode. Special entities: force fields and health packs.